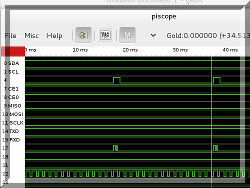 piscope is a logic analyser (digital waveform viewer) for the Raspberry. It shows the state (high or low) of selected GPIO in real-time. 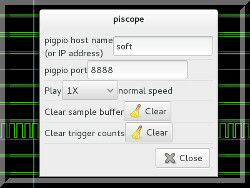 piscope uses the services of the pigpio library. pigpio needs to be running on the Pi whose GPIO are to be monitored. The pigpio library may be started as a daemon (background process) by the following command. Windows PC) You need to install an SSH client (putty suggested) and a X11 server (xming suggested). Run Program Files -> Xming -> XLaunch and accept the defaults. Run putty and enter the Pi's host name or IP address. Click on SSH X11 and tick Enable X11 forwarding and then select Open. The latest GPIO samples are displayed. 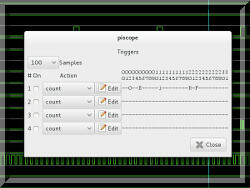 The mode will automatically change to Pause if a sampling trigger is detected. There are four triggers. Each trigger is made up of a combination of GPIO states (one of don't care, low, high, edge, falling, or rising per GPIO). Triggers are always counted. In addition a trigger may be sample to, sample around, or sample from, a so called sampling trigger. New samples are added to the sample buffer. Once the sample buffer is full the oldest samples are discarded. Recorded GPIO samples are displayed. The play speed may be varied between 64 times real-time to 1/32768 of real-time. The page up key increases the play speed by a factor of 2. The page down key decreases the play speed by a factor of 2. The home key sets the play speed to 1X. Once the sample buffer is full new samples are discarded. The left and right cursor keys move the blue marker to the previous or next edge. By default all GPIO edges are considered. Clicking on a GPIO name will limit edge searches to the highlighted GPIO only. The left and right square bracket keys move the blue marker to the previous or next trigger. The time between the blue and gold markers is displayed. The gold marker is set to the blue marker by a press of the 'g' key. In all modes the down and up cursor keys zoom the time scale in and out. To download and install piscope. You only need to perform this step if you want to build the executable from the source files. This is not needed if you use a pre-built image. WARNING: Installing gtk+-3.0 uses a lot of SD card space. Most of the space used by gtk+-3.0 is taken up by unneeded *-dbg packages. With *-dbg packages an additional 3753MB SD space is required. If you edit the list of packages to be downloaded and remove the *-dbg packages only 134MB of additional SD space is needed (as at the time of writing).